The Korean-made Hyosung Sense is the best scooter anywhere! The strong 49cc motor, wide 10” wheels, disc brakes, and large seat all combine for an unbelievably comfortable and safe ride. The full one year warranty typifies the quality throughout the scooter. Shop around to compare features, price, and warranty, and then test ride the Hyosung Sense. You’ll find it’s the best way to make “sense” out of spending your money. – Strong acceleration and great fuel efficiency. – Much brighter dual headlight light, designed to be suitable to domestic and European regulation, improves charge performance of generator and luminous intensity of headlamp making night driving safer. – Disk brake for covering safety and extra-wide tire (100 mm). Guarantees perfect driving stability by employing front wheel disk brake of excellent braking capability and the greatest extra-wide tire in same rank. – Tail light of automobile sense. Enhanced safety in driving at night with, of course, beautiful that external appearance by employing tail light of automobile sense for the first time in the country seeking sedan-type styles. 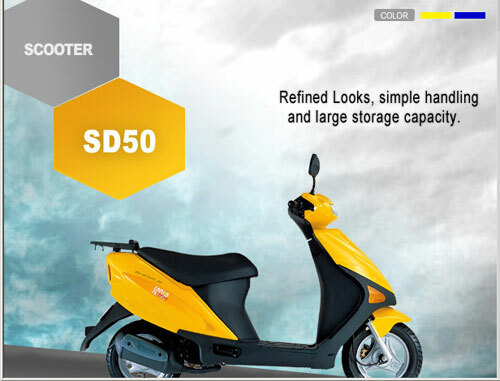 The powerful 50cc engine SENSE provides excellent acceleration capability and sensitive throttle reaction, even on the most difficult roads. 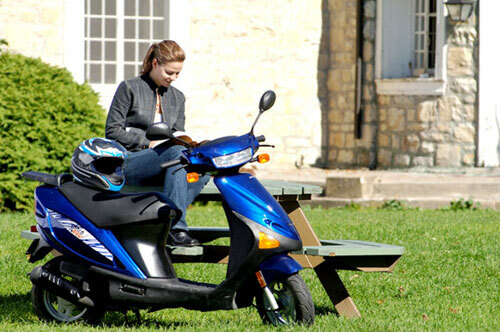 ability giving you a comfortable ride even over long distances. Disk brakes provide enhanced braking to ensure your safety.